I have been playing around with popover recipes for a while now, so I thought I would "get serious" and buy a popover pan. The new pan makes a huge difference, not so much in taste, but in appearance and how big the air bubbles are inside of the popover. Popovers could not be easier or cheaper to make, and they are such a treat, hot out of the oven with honey butter or strawberry jam!! If you do not have a popover pan, see note at the end of this post. This recipe is fool proof as long as you follow the easy steps closely. Preheat your oven to 425 degrees. I put my popover pan in the oven while it preheats (do not grease the pan while it is preheating in the oven). NOTE: If I have whipping cream on hand, I put about 1/4 cup of whipping cream in a measuring cup and then fill the rest of the way with 2% milk...if I have no cream on hand, I just use 1 cup of 2% milk). After the above ingredients are whisked together well, add one cup of all purpose flour (spoon flour into measuring measuring cup and level off with straight edge). Whisk everything together for about 30 seconds or until it looks very smooth and creamy. Take the popover pan out of the hot oven and spray each cup with vegetable spray. Put a small chunk of chilled butter (roughly 1/2 teaspoon but the exact size is not crucial) into the bottom of each HOT cup. Fill each cup half way full with batter (makes six big popovers). Bake popovers at 425 for 20 minutes. After 20 minutes, turn the oven down to 325 and bake for another 15 minutes. Remove popovers from pan and poke a tiny hole (I use a toothpick) in the bottom of each popover to relieve a little steam (not totally necessary if you are going to eat them right away). NOTE: If you do not have a popover pan, you can use 6 ounce (oven safe) custard cups (I used the clear Pyrex ones, for a long time, with great success). I placed them all on a cookie sheet for easier handling. The popovers will not get quite as tall (as they do with a popover pan) but they taste every bit as good. Someone from outside the USA wrote and asked me what a popover pan was, so here is a photo. 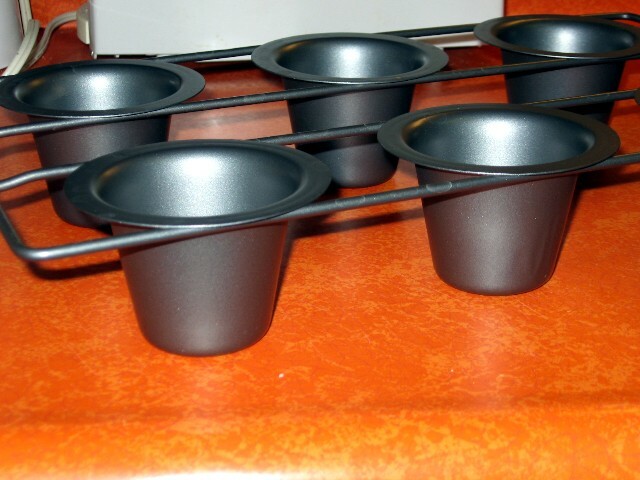 As you can see, it is almost like a cupcake pan, but the cups are a lot deeper and spaced far apart so the hot air can circulate around each cup. OMG! Those look fantastic!! I recently bought a popover pan because I love popovers. I'll have to give it a shot, real soon. 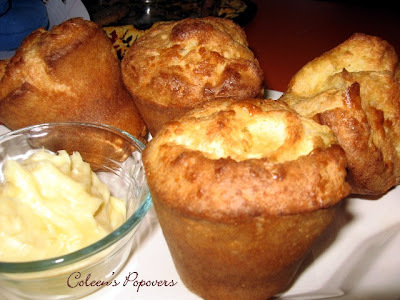 I haven't had popovers in forever, those sound amazing right now! I loved the popover's recipe but here in Portugal i've never heard about popover pan. what kind of cakes are these and the pan is for the hoven? To Ana Rita...I posted a photo of a popover pan for you at the bottom of the popover recipe post. I saw you comment on Mary's - One Perfect Bite and wanted to pop over and say hi. You had asked about the melting with the chocolates. I have to tell you, I use the chocolate bark, one package to one container of unsalted peanuts, and it never melts in our hands. It is absolutely wonderful. All I do is, put the package of bark in the microwave per the package instructions, stir in the peanuts and drop happily onto parchment paper. When they dry, they dry. They aren't messy, and you don't have a bunch of pans to clean. I really love it. Give it a try and let me know what you think. My family insists that I make them for every occasion. I can't wait to try this wonderful recipe that you have shared. I have never seen a popover pan either, so I am tickled to see one. Now I too know what I am looking for. I am Country Wings in Phoenix, your newest follower. I can't wait to see what you share next. Please stop by and say hello. I would be thrilled to have you follow me as well. I love sharing day to day with my blogger friends. 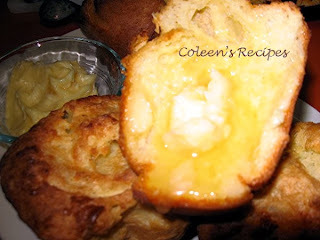 To Atty: This recipe makes six LARGE popovers. I have never made a popover nor eaten one, but I do believe I would enjoy! I'm going to have to go out and buy me a pan and make some of these! Great thought for a Sunday morning here! I live in the Andes mountains (south america), does the recipe change because of the altitude? if yes how? TO IDEACOVA: I'm sorry, I have NO experience with altitude cooking. I do not know what the changes would be. Those look delicious! 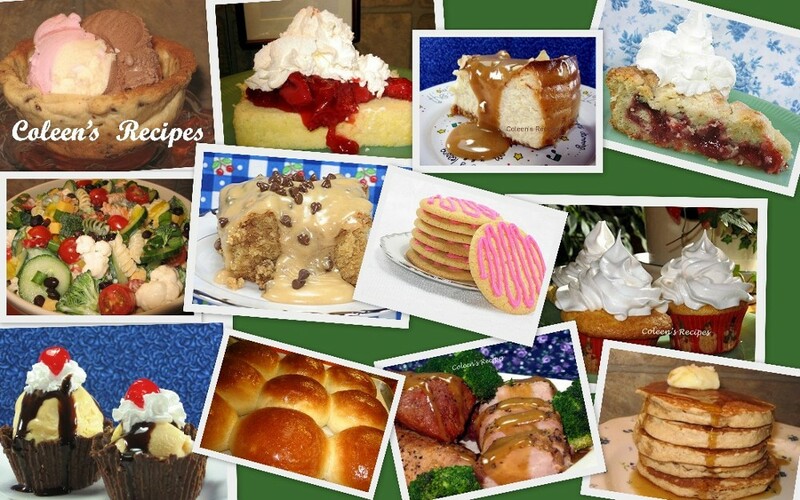 Please share your recipe with our readers by linking up at Muffin Monday. Thanks! I absolutely LOVE these! Never had any before I tried these....thanks Coleen.